SCOTT ROSENBERG is an award-winning journalist who left the "San Francisco Examiner "in 1995 with a group of like-minded colleagues to found Salon.com, where he served first as technology editor, later as managing editor, and finally as vice president for new projects, leaving in 2007 to write "Say Everything." For much of that time he wrote a blog covering the world of computers and the web, explaining complex issues in a lively voice for a non-technical readership. His coverage of the Microsoft trial, the Napster controversy, and the Internet bubble earned him a regular following. Rosenberg's writing has appeared in the "New York""Times, Wired, "the "San Francisco Examiner," and other publications. His previous books include "Dreaming In Code." Visit his website at www.wordyard.com. 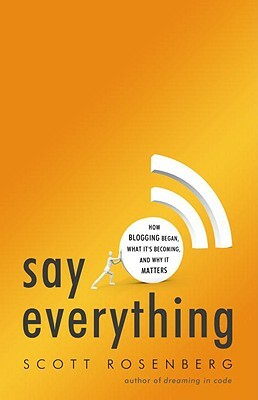 "This is a terrific history of blogging and a convincing case for its enduring significance. Rosenberg mixes the personal with the conceptual in the same wonderful way that the web does." “Scott Rosenberg is the best defender blogging has ever had. He eludes hype. He comes with no motive to debunk. He knows the history cold, and tells his stories calmly. On what to credit blogging with, and how to delimit it, there is no one with finer judgment. And he is poetic on blogging as a democratic thing. Say Everything is where I'd tell you to start if you want to understand where blogging came from, and why it's important. "Eminently readable and historically definitive...Rosenberg has made it clear why the blogging revolution matters. Certain to be a classic." “The birth of newspapers, radio and television were fascinating events, filled with larger-than-life characters. The thing is, you didn't live through that, and the other thing is, there's not a lot you can do about it now. Blogging is now, it's real, it's fascinating and you're not just watching. Scott takes you on a guided tour of what got us to where we are today." "Scott Rosenberg provides an excellent fifteen-year history of the voice of the person' on the Web, from Talking Points Memo to Twitter, and profiles both idealistic pioneers and scrappy entrepreneurs. He offers a cogent look at not only what's new, but also what's next."